So if you’ve lived in South London all your life, or you fancy finding a new destination for a cracking Sunday roast, then we can’t think of any reason not to make the trip. Plus, picture this. The winter season is drawing in, and we all know what that means - getting a bunch of friends together for a good old holiday catch-up. But is the bar big enough, I hear you say. Can I fit my ever expanding friend base in the restaurant? 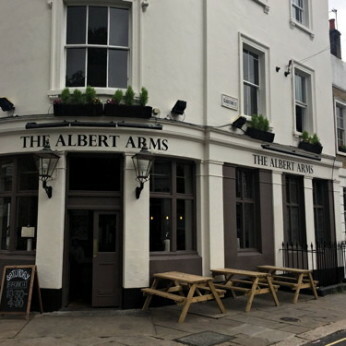 Well have no fear, as the Albert Arms has got you covered. Take a seat in our private dining room, where you can enjoy all the perks we have to offer, in the sanctity of your own upstairs hideaway. From seared wood pigeon and coco de paimpol beans on toast, to the eye popping and lip smacking buffalo chicken hearts (yes you read that right), the emphasis on local, seasonal, and downright delectable is evident in everything he does. Did you and your loved one first lock eyes over a lager? Or was it Prosecco that fuelled your passion?